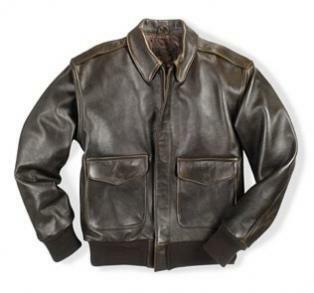 During WWll, the "battle worn" look of a pilot's jacket reflected his bravery and it became one of his most prized possessions. The leather in our 100 MissionÃ¢Â„Â¢ jacket is vintage lambskin with natural graining and surface characters which may look like irregularities but are not. These give each jacket a unique style and glory. As you wear it, the color will lighten and the leather will take on added texture giving it a more vintage look. It has Mil. Spec. A-2 detailing with no fiberfill or bulky insulation which makes this jacket perfect for all season wear and excellent for Southern climates. Features a woven equipment label in the lining, side entry hand warmer pockets and an interior pocket for wallet, MP3 or other accessories. Proudly made in the U.S.A.